A vast network of historic roads shadows the Interstate Highway System of the United States, just waiting to be repurposed into a Green Interstate Network (GIN), a web of routes equipped to facilitate operation of renewable energy powered vehicles that feature autonomous navigation. Veer your mind off the Interstate Highway System and onto the GIN for explorations here. Please allow this site to invigorate your imagination about how today's byways can be repurposed. Get a taste of the GIN. A GIN for America will evolve segment by segment due to the efforts of entrepreneurs, city and town councils, county boards, and state transportation departments. That's my hope, anyway. This website offers you information about the origins of, and the ideas driving, the green interstate network concept, as well as videos about routes that I recommend for inclusion in the GIN, such as U.S. 12 and U.S. 20. Another site, greeninterstate.net, is being designed dedicated to you, a social networking site to utilize as you travel green interstate routes. I hope and expect that, in the U.S. and globally, individual GIN segments will be defined by visionary civic leaders and citizens. Each route, between town A and town B, for example, including the main street and an appropriate alternative route through each town, the speed limit between them, and the infrastructure where electric vehicle, and hydrogen-powered vehicles, can recharge, will be agreed upon locally, then codified nationally. Examples of green interstates are already coming into existence internationally and in the U.S. Your locality, the individuals in the town or city where you live, are invited to engage in discussions focused on where to locate routes that link up, growing to stretch from coast-to-coast, and that are latitudinal, longitudinal and diagonal, just as the current interstate is. The GIN should mirror this interstate design logic. As ever more steps are taken to retrofit beautiful and historic pathways across America, always designing the do-overs to accomodate renewable energy powered autonomous vehicles, the GIN routes will revitalize economies of towns once brimming with vitality, back before the Interstate Highway System was built and bypassed them. When outfitted thusly, as GIN routes, these sustainably designed, new-old roadways across America, will also draw national and international tourist traffic for recreational explorations (dining, lodging, and shopping), inevitably leading to an abundance of local economic renaissances. Consider whether your locale ought to be a part of this budding nationwide travel alternative. Perhaps your neck of the nation deserves to be a segment the GIN. It is my bet that if you adopt early, the early-adopter eco-tourists will come, followed by the rest of us. The graphic below offers a safe link to a PDF of a draft resolution I prepared, with help from lawyer volunteers, to establish a green interstate segment where you are. Nationwide, economic revitalizations will come about as segments of a green interstate are embraced by ever more localities and traveled by EV riding eco-tourists, early-adopters of the concept, then all of us. The GIN system will be brought into existence without the environmental degradation and the carbon footprint new road construction causes. Tomorrow's green interstate already exists! Sure it needs sprucing up, using the greenest techniques possible, but as a pre-requsisite, no new land will be taken from nature or taken out of cultivation for its creation. The routes are already full of fun and surprises to explore. All that is needed is to add the renewable energy powered autonomous vehicle enabled infrastructure. Build it and we will come. An incredibly important aspect of GIN routes is their availability to be used by today's existing conventional vehicles, including farm vehicles, as well as by the most basic personal mobility, upright bipedalism and pedalling, walking or riding bikes, and yes including by horseback and by horse-powered vehicles. This needs to be accomplished in partnership with all who use the routes and the local authorities who maintain and control them. Also extremely important, is our call for rapid implementation, all along the green interstate network, of the new Dedicated Short-Range Communications (DSRC) technology for V2V, (Vehicle-to-Vehicle Communication). Now it means nothing to you. But very soon it will. It will be extended to the roadway infrastructure and other roadway users, such as cyclists, pedestrians, and lower speed vehicles, establishing a V2X ecosystem. Using DSRC-based V2X communications, all vehicles can be notified of hazardous road conditions, traffic light statuses, changing work zones, and also important, of slow moving vehicles ahead. Please watch our video on this page revealing sunset on U.S. 20 in Indiana. Phew! You'll see horse drawn carriages at dusk interacting with fast moving vehicles. Scary close calls! Flash forward a couple years. V2V works within a range of nearly 1,000 feet, so drivers can be alerted to slow moving vehicles and bikes in time to avoid a crash. DSRC for horse-drawn buggies? You will note they have thankfully adopted reflectors. I respectfully suggest that their owners consider DSRC in addition to the reflectors. Ditto that for farm vehicles! Equipped with DSRC technology for vehicle-to-vehicle communication, with electrified power trains, and autonomous-driving-capable, the vehicles rolling along the green interstate network will of course be created by major auto makers who are already testing systems. Additional vehicles will come from the autonomous services being pioneered by Google and Apple, among other dot coms. Still others will be from traditional rental car agencies, and from the Ubers and Lyfts of the globe. Along with all of them ought to roll properly DSRC-equipped innovations of garage tinkerers, of college engineering school teams, vehicles formally-termed Medium Speed Electric Vehicles (MSEVs), Low Speed Electric Vehicles (LSEVs), and Neighborhood Electric Vehicles (NEVs), even though they have not been crash tested by the National Highway Traffic Safety Administration. Greeninterstate.com serves as a clearinghouse for information about GIN developments, as well as the developer of an expanding database of details about what stretches of roads have gone green, both nationally and internationally. 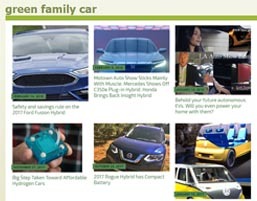 GreenInterstate.net is currently being developed as your social network for use on green interstate network segments. Founder of the green interstate movement, Dean Adams Curtis, was interviewed for this 2009 Time magazine piece examining the concept. 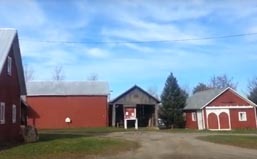 The first statewide planning meeting for a green interstate segment was held in the above barn, located in Saline, a town in Michigan along U.S. 12.